Appmk is a company which is committed in providing users with practical and cost-effective solutions to create apps for Android-powered devices. We provide series of app makers to provide convenicence for content owners such as writers, cartoonists, etc with no program skills. Android book app maker specializes in building good-looking and functional eBook apps for Android viewing without any programming skills. And it assists people who find a way to market eBooks on Android more efficiently. For a minute or two, the common text files become flipping or scrolling eBook Android app embedded illustrations and those elements what a real book is supposed to own or not. Extra it allows you to control book outer appearance completely to reach perfect display. Android magazine app maker is software that helps building Android magazine, comic, catalog, etc apps with PDF, image or audio files for book marketing on Android markets or other usage without coding project. It is the fastest way to make page-flip Android apps for publishing and marketing. The output app displays powerful interactional functions and gorgeous flipping effect which make reading process enjoyable. Android live wallpaper maker is utility software that makes live wallpapers for Android screens on the Windows platform. It provides broad stage for you exploring the talent on Android wallpapers creating. Over imagination, the common images turn to special masterpieces which will be applied as Android screen background by those people who love them and feel valuable. The millions of Android users would be becoming your perspective market if you could supply with stunning wallpapers. Android music game maker is Windows software to produce piano games played in Android devices that fingers dance to the rhythm of music and therefore break syllables falling down upside to the top surface of a piano keyboard. This kind of game trains your agility, reflexes, besides it takes you so much happiness and relaxes. You can import lots of music files each as a standalone one in list and setup notes disperse on 5 audio tracks lies on its rhythm. 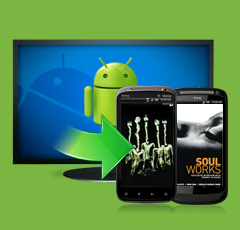 Android showcase app maker is professional product/item showcase software. This showcase maker allows you to generate vivid item showcase with sliding effect. It enables readers to view the showcase items in different detailed images, which helps display your items clearly. It is absolutely a great solution to present your products.